that would be the sound of my wee mental time clock. I've spent the day archiving - basically, I spend the next few weeks with a scanner, Adobe PDF and 38 boxes full of 6 years of financial and investor information. Why would I conceive of such a project? What was I thinking when I proposed such a task to the Higher Pay Grades? When did I begin smoking crack and pot all in the same pipe? All good questions, no good answers. Also, in my aspirations of being a greener person, we use WAY too much paper, such a waste. This is the beginning of my quest to encourage my group to go as paperless as possible. Why print something out to fax it if I can PDF the doc and email it? Why FedEx a 2 lb pack of information they will take 2 to 3 days to arrive when I have a 1.25 MG file with all the info right there and they can have it in seconds. 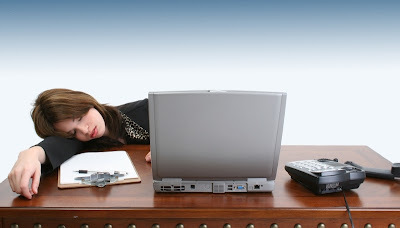 I'm rambling today - the semi-subtle hum of my desktop scanner has lulled me into a Bottom of the Ladder Coma. wah... huh...[snort]...wait... what did I just say? August 6, 2007 by Carol.